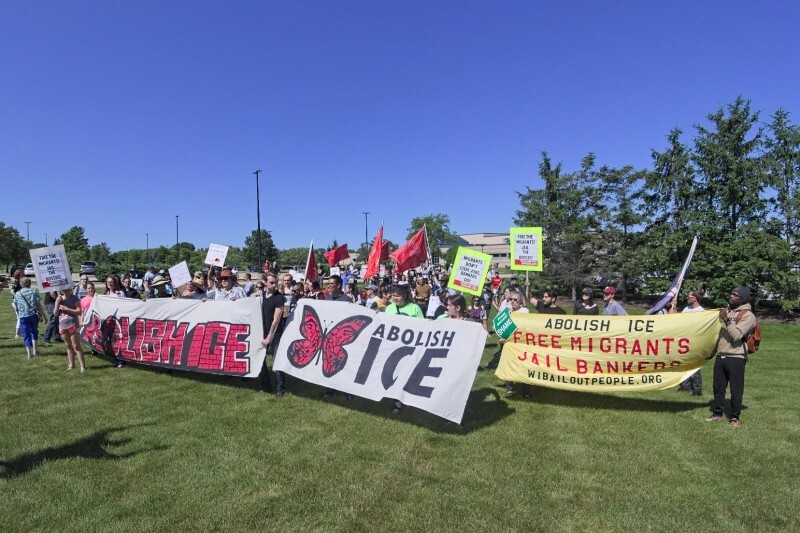 Scores of protesters march on immigrant detention center in Kenosha, WI | Fight Back! Kenosha, WI protest in defense of immigrant rights. Kenosha, WI protest in defense of immigrant rights. Kenosha, WI - Protesters rallied outside the Kenosha County Detention Center, July 7. Dozens came together to demand the abolishment of Immigration and Customs Enforcement (ICE) in a show of solidarity with the detainees held in the center. Demonstrators hoped to raise local awareness of the impact that the federal agency has on Wisconsin’s immigrant communities, including the threats of detention and deportation. Tania Chavez, an activist with Youth Empowered in the Struggle (YES) and DACA benefactor, expressed her anxiety about deportation, which threatens her family. “We do not abolish ICE without standing with our Black and refugee communities, we do not pass a Clean Dream Act unless we stand with no Muslim ban, unless we stand with ending racial profiling. If you only stand for one issue, how can you stand for every issue? You stand for every issue; it is one struggle,” Jimenez said. Considering Trump’s most recent order allowing for the detention of refugees indefinitely, this action is a beautiful and much-needed act of solidarity among the people of southeastern Wisconsin. Jess Patel, the primary organizer of the action, said this is the beginning of a long struggle and is looking forward to future actions within our communities. Local community activists, namely members of the Industrial Workers of the World (IWW), organized the rally.